Getting the scoop on Gus Van Sant's Elephant took some serious globe-hopping. Last May, I attended the press conference for Elephant at Cannes, following the world premiere screening, where Van Sant was flanked by his producer, Colin Callendar, head of HBO Films; and I interviewed the personable Oregonian one-on-one several months later, at September's Toronto International Film Festival. Van Sant: "The origin of the project was way back, when Columbine was happening. I had an idea to do a mainstream TV program, a more traditional, straight-ahead drama about the real kids, get their problems and put them on the air. Harmony Korine was going to write a screenplay. I pitched it around LA but nobody could entertain doing a movie because of sanctions against violence. Until Colin Callender told me we could do Elephant for HBO Films." Callender: "It's not that we couldn't do Columbine, but I thought just showing the events straight might not do it. Why not something more exploratory?" 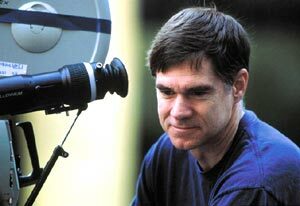 Van Sant: "I wasn't thinking of playing to an audience of TV viewers, to someone switching from HBO to West Wing. I treated Elephant as a film. But we don't usually in film get to work in 1:33, the television format, and also that of 16mm films projected in schools. Harris [Savides, the cinematographer] and I were very excited about that. "I decided to continue with the way Gerry was put together: a film that didn't have a hard script and could change every day. We started out using a very wide 8mm lens like Kubrick's A Clockwork Orange, but that didn't work. It was too distorted an image. Following all these characters with a camera [in long, long takes] is something that evolved that we liked, but we don't know why. One of my favorite shots is holding on the back of [teenager] Alex Frost's head while he plays the piano. We were going to hire a Seattle jazz musician to compose music. But one day during the shoot, Alex was playing piano in the high school cafeteria. Beethoven's Moonlight Sonata was one piece he'd learned, so we used that for the film. "We'd watched Bowling for Columbine before shooting. It's brilliant. I'm a big Michael Moore fan, glad we have him. Lots of incidents in my film come from information about what actually happened at Columbine. When Alex drinks from a cup in the cafeteria, that's from a Columbine surveillance film." A European critic asked Van Sant if he wants the audience to feel emotionally for his high-schoolers? "It's not that I don't want you involved in the characters, but I want you involved by watching them, an observation, the way documentarian Frederick Wiseman sits back and lets things occur. We could have invented a more traditional psychological narrative. I have my ideas why Columbine happened, but that's not this film. I wanted a poetic impression rather than dictating an answer. I wanted to include the audience's thoughts." At Cannes, I asked Gus Van Sant one question: whether Elephant was shaped, as was Gerry, by the cinema of the Hungarian filmmaker, Bela Tarr? "He continues to be an influence," Van Sant said. "The overlapping of moments, the repeats, repeats, in Tarr's Satan's Tango, inform part of this film. His long pieces of film are still inspirations, but also the works of Tarkovsky, Jansco, and Sokurov." Away from high modernism, what did Elephant get from popular culture? When I talked with Van Sant at the Toronto Fest, he confided one major influence on Elephant which he certainly hadn't mentioned at Cannes. Video games. "I didn't know anything about them, but people kept saying, 'It's those games that cause violence,' so I started watching them. And playing them. I played Tomb Raider until I was obsessed with it. It calls for an interactive imagination, and there are some intellectual sides to some other games. When we were making Gerry, I showed Tomb Raider to Harris. What I wanted to do technically was almost impossible, without a huge budget like The Matrix. Among other things, I'd have the camera behind a character and it suddenly flips in front. But I was afraid to reference the video game in front of my actors. My sound man said to me on the set, 'I played a couple of rounds of Tomb Raider,' but I didn't answer him, keeping quiet around Casey and Matt." So, do video games cause violence? Especially ultra-violent ones like Doom? "If you obsessively do anything, like playing solitaire for solid weeks, that might influence your behavior, make you anti-social. If you play Doom, you are meeting people on the Internet, you dodge bullets, shoot them. The person you just shot might be a 14-year-old girl in Minnesota. If you do that for a long time, you start to fantasize. You might say, 'Let's get back at people we don't like.' In Elephant, one of the killers is briefly playing a video game. We couldn't get rights to Doom so we designed one ourselves that resembles Gerry, with two guys walking in a desert." Perhaps the bulk of Elephant is a reality-based, slo-mo video game? The high-schoolers walk and walk and walk prior to the climactic shootings, when many of these walkers become human targets. "Hollywood busies itself with ultra-scene changing, getting quickly in and out of places," says Van Sant. "But a lot of stories happen in our lives when we park six blocks away and walk. If we can show walking slowly to a mailbox and back, it can be a brilliant, brilliant film."